Today Konami released the first DLC pack for Metal Gear Solid V: The Phantom Pain, consisting of several costumes to be used in the game. 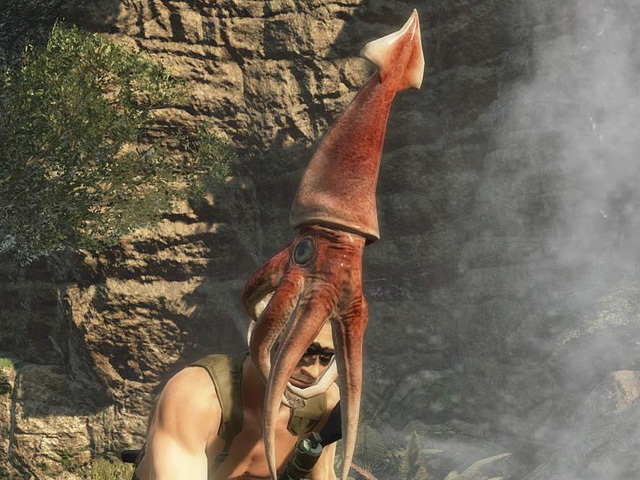 But Metal Gear Online also received an update: the squid hat (officially called ‘The Cephalopod’) is now available and can be purchased with MB Coins. More items will be added soon. New DLC is out today for MGSV single player, but MGO gets a supply drop as well with the Squid Hat! The Squid Hat joins the Croc Hat, both of which can be added to your character through MB coin purchase, and more items will be here soon! If you’ve been saving up those daily MB rewards, nows the time to redeem them, and show off those pro-level skills–ever lost to a Squid? Lastly we’ve made a few adjustments in MGSV:TPP. Matching & Certain UI elements have been adjusted, Effects of nuclear weapon ownership have been adjusted as well extending FOB blockade duration +1 day for each nuke owned. And the notification timing when an intruder infiltrates your FOB has also been changed. Don’t forget also to participate in our latest FOB Mission and earn extra rewards for reaching a rival’s core FOB 5 times before 10/27. 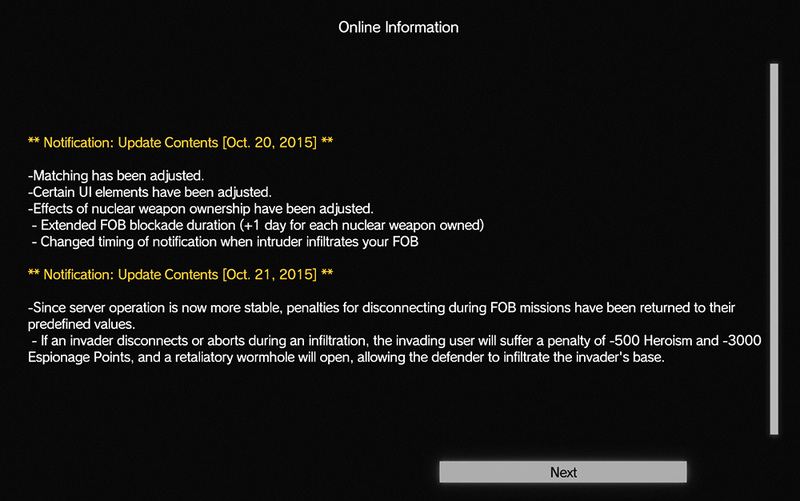 Additionally, Konami issued an update related to penalties for disconnecting from FOB missions.